Today, President Donald Trump met with leaders from five Caribbean countries in Florida; namely Jamaica, Saint Lucia, Dominican Republic, Haiti and the Bahamas. Notably, these countries voted with the U.S. and against the Venezuelan president, Nicolas Maduro, at the O.A.S. in January. Belize was not invited to participate. Central to the meeting was the situation in Venezuela and other issues of trade, security and U.S. investments were discussed. Some of the leaders spoke with the U.S. press and said that the meeting left them feeling encouraged because the U.S. wants to encourage and promote a stronger relationship with the region. 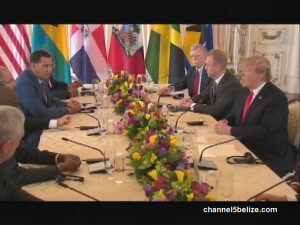 Jamaica’s Prime Minister Andrew Holness is quoted as saying, “We’re satisfied that there will be instrumental action with that message.” In this news clip from NBC News, Trump welcomed the Prime Ministers and Presidents where each of them gave an overview of what they hoped to get out of the meeting.